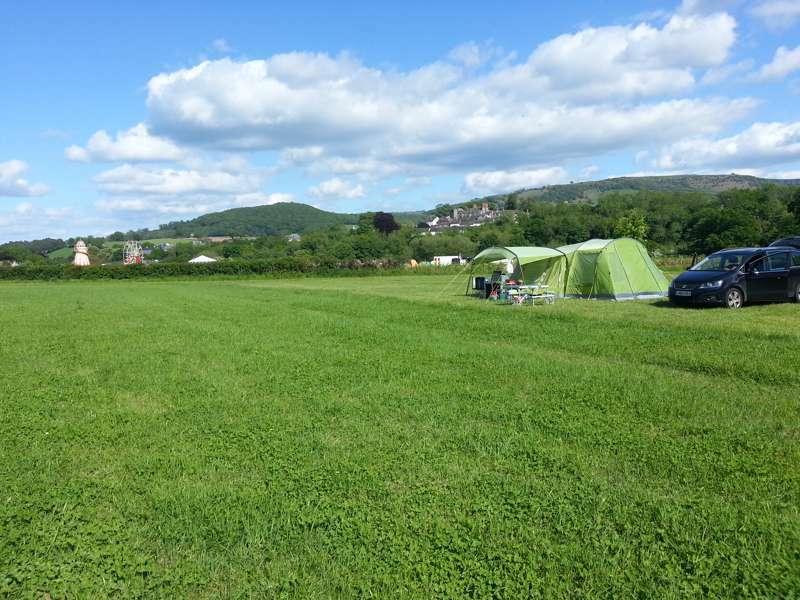 We have around 60 undesignated tent camping pitches in the orchard and on the field facing the charming town of Hay-on-Wye, a 5-10 minute stroll away. The Wye Valley Walk runs through Racquety Farm and the Offas Dyke trail is adjacent. 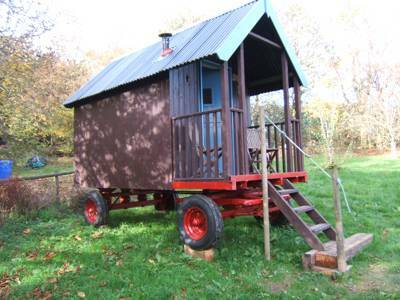 Craftsman made Shepherds Hut with double bed, wood stove, electricity, fabulous views and outside seating area. It’s not clear whether it would be quicker to walk or to canoe to Hay-on-Wye. Both are possible from Racquety Farm and, just a few hundred metres from the edge of town, it takes a matter of minutes until you’re perched on a chair outside a tea shop, cuppa in hand, watching the world go by. 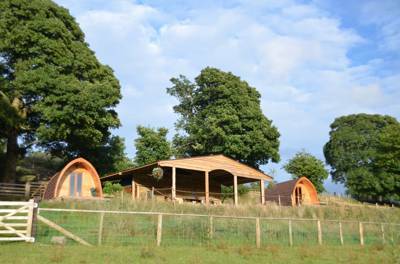 As campsites go, few can manage such a supreme combination of tourist-town proximity and remote, countryside feel. 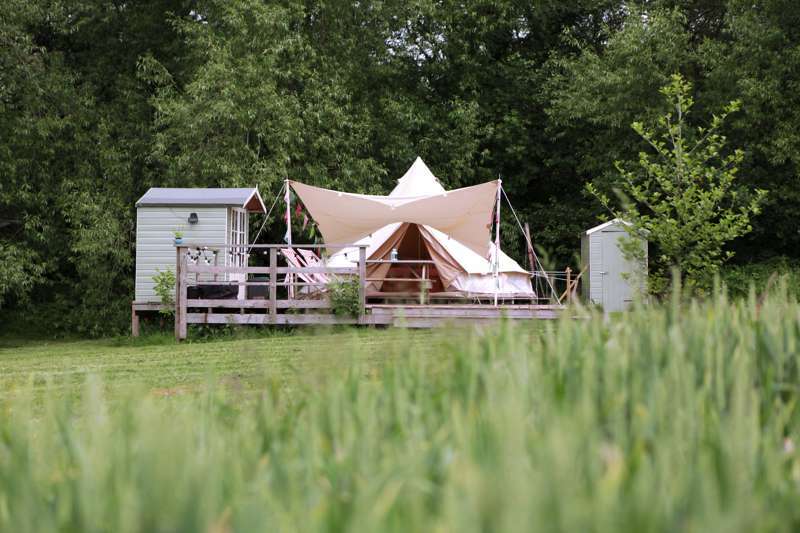 Pitch your tent beside the bushy hedgerows and you seem hidden in the verdant Welsh wilderness. Walk across the meadows into town, however, and you’re suddenly in the bustling hive that is Hay-on-Wye in summertime. Racquety Farm is quite an enterprise. 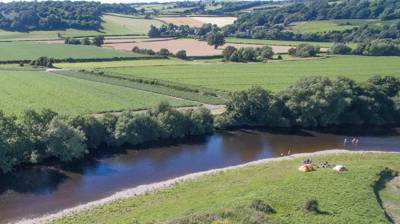 A mix of woodland, orchards, organic crops and grazed pastures, the farm is situated directly on the banks of the River Wye – its banks are a designated Site of Special Scientific Interest. The result is a conscientious campsite, with plenty of recycling, composting toilets and no caravans or large motorhomes allowed. 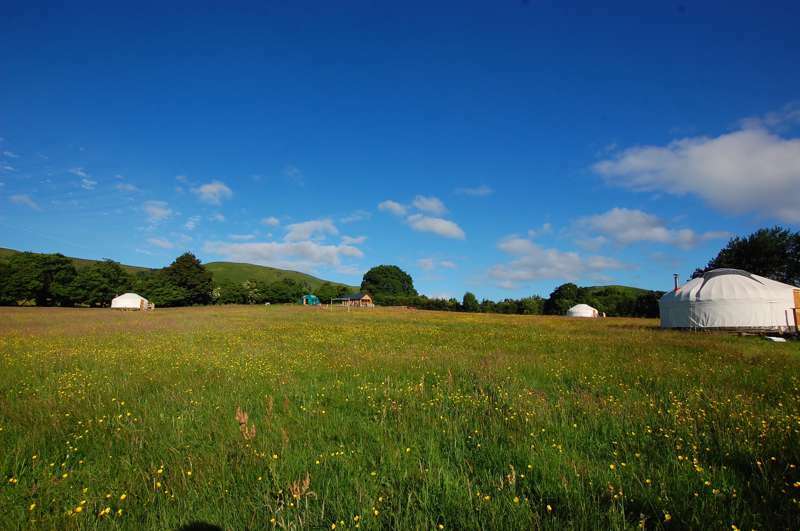 The farm is all organic and one acre is even used for the Hayfield Community Garden, a local food-growing and gardening scheme set up by the people of Hay-on-Wye. 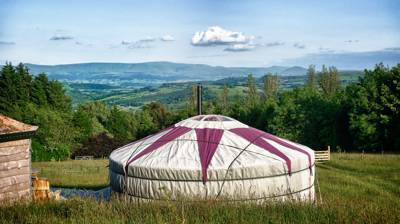 The camping, though basic, is idyllic, in the form of roughly 60 undesignated pitches spread around the orchard or in a slightly sloping meadow, along with five geo-domes for glamping. 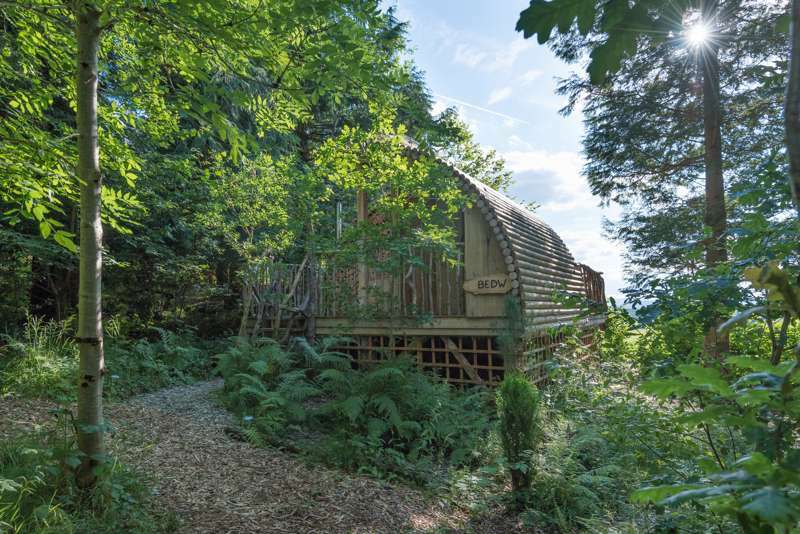 Each of these is a different size, ranging from a four-metre dome for a couple to a ginormous six and a half metre dome that can sleep up to eight people. Each was homemade by Geoff the owner and are furnished simply but practically to create warmth and comfort for most weather conditions. Carpets, beds and bedding, wooden furnishings and electric lighting are all included. Most importantly, there’s also a cosy wood-burning stove. There are relatively simple hot-water shacks where you can do your washing up, brush teeth or take a shower and braziers are available to rent for that essential evening campfire. And there's more good news in that they have a separate two-room B&B for those who want a bit of extra home comfort. The real appeal of Racquety Farm, though, is the river. Kingfishers and herons can be spotted and otters are known to frequent the area, along with badgers, hedgehogs, red kites, woodpeckers, dormice, bats and owls also. Ros’s son runs a well-known canoe hire company from the campsite – 'Want to Canoe?' – and you can launch your own canoes directly from the farm. Multi-day outings are highly recommended, partly for the full experience of the river and partly to give you more time in the canoe. The River Wye has popular wild swimming sites just a short walk from Racquety Farm or stick to terra ferma and wander into Hay-on-Wye. The town is just moments away and that café cuppa awaits. For latest availability and best prices for Racquety Farm, please use the Date Search above. 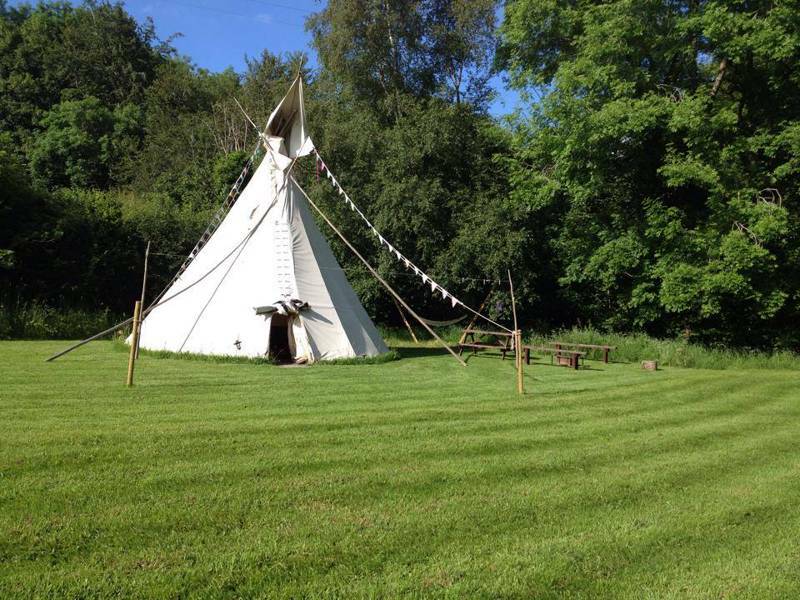 This site is well located within an easy walk of Hay on Wye, and the field itself is pleasant. However, it's described as being by the river and actually you can't see the river from the camping field and you can't access the river (except for canoeing) without walking in to Hay. We were not impressed with the toilet and shower facilities, we are used to campsites with composting toilets but these ones were dark, smelly and covered in cobwebs and our children hated using them. Composting toilets can be fresh, bright and clean so it shouldn't be an excuse for inferior facilities! In any case the main toilet isn't a proper composting toilet, it's more like a long drop (into a bin) which is probably why it was smelly. The showers are behind the washing up areas so lose pressure when someone is washing up and again are dingy and cobwebbed. On the plus side the water was hot and we didn't need to wait to wash up. Admittedly we stayed over the bank holiday weekend but the facilities were not adequate for the number of people staying - the 2 toilets and 2 showers were supplemented with a couple of portaloos and a portable shower (which look very unattractive) but the site was very busy and we had to wait for the toilets and showers more often than not. The recycling facilities are just the standard council offer, previously when we have stayed at eco campsites they have used specialist recycling companies which mean you can recycle far more, such as plastic film etc, so I'm not sure why this is claimed as a particular feature of this site. The owners were nice but all in all we were really disappointed in this site, especially as it was not cheap. Definitely won't be going back! I loved this site. So relaxed and simple. The compost toilets weren’t as scary as I expected, and other facilities good. Ros was lovely, and the children enjoyed walking her dog around the campsite. The site seemed very quiet, given it was the summer holidays. We aren’t the most sociable of campers, but it was even a little quiet for us! Racquety Farm is wonderful. Really well run. Composting loos and showers are practical, well maintained and it all works. We camped in the corner of the top field, surrounded by perfect views and ripe blackberry hedges. A five minute walk down a public footpath took us to the perfect stretch of river for an evening swim. We took our canoe, and the team at Want To Canoe picked us up six miles down the river with minimal fuss. This whole business gets the balance just right - it feels informal and relaxed, but seriously well run by a team who really know their stuff. Warm welcome from Ros. 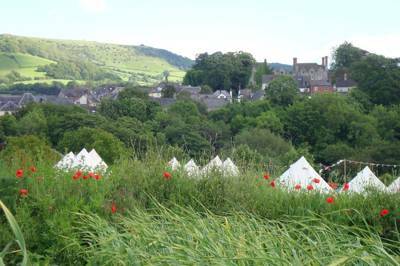 Beautiful campsite, perfect for walking, cycling and canoeing. Short walk to Hay on Wye, where there are plenty of places to eat and drink. Would certainly return. Very relaxing 2 night stay in the orchard field. The owners Geoff and Ros are friendly and helpful without being intrusive, and their commitment to sustainability in all aspects of the site is inspiring. It’s great to enjoy your own camp fire in the evening, wander through the farm and down to the River Wye, or walk 10 minutes into Hay on Wye. Would recommend to anyone looking for a proper camping experience and hope to return. We, 4 adults, stayed for 3 nights with a toddler and a baby in 2 tents. There was plenty of space for the 2 year old to explore safely. Ros wandered around occasionally making sure we had plenty of wood for the fire and everything was ok for us. I was a bit unsure about the composting toilets but discovered they were no problem to use and were clean and odour free (mostly). It didn't take long to get used to them and they weren't at all unpleasant. It was a very short walk into Hay or down to the river and along the river path. Plenty to do and see and lots of places to eat. It was nice to go to sleep and wake up listening to the wild life, although the horses galloping along the next field was a bit of a surprise. We'll definitely be going back for another stay. Lovely site with amazing location and facilities. Enjoyed being able to have campfires. Owners were very friendly and helpful with information about town, directions and local attractions. 60 undesignated pitches, plus a few gravel areas for campervans. 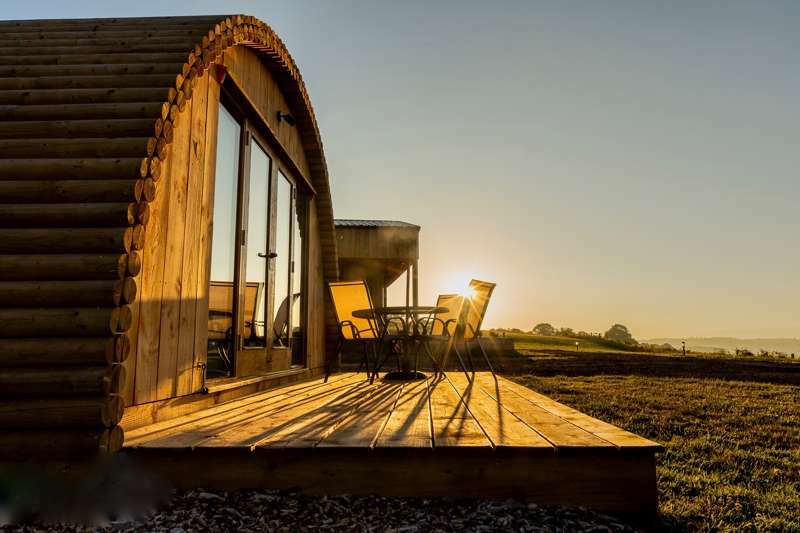 Geodesic domes and 1 Craftsmen made Shepherds Hut also available – the biggest sleeping up to 8 people – and there are 3 rooms in the B&B. Tents, glampers small campervans, dogs (on a lead) – yes. Motorhomes and caravans – no. Large groups by prior arrangement. During the Hay Festival Season (24 May-3 June 2018) dogs are not allowed onsite. 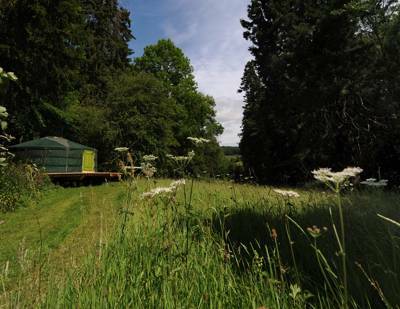 Directly adjacent to the campsite there is Aubrey's canoe hire company (01497 820604) – you can slip straight out onto the water and paddle into town or further afield. They can pick you up again further downstream or start in Glasbury-on-Wye for a longer spell on the water. 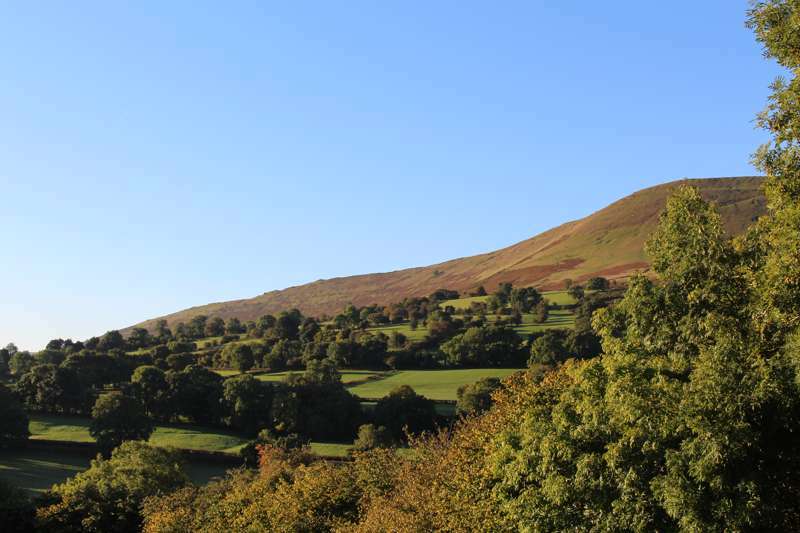 Sailing (01874 658596) is also available at nearby Llangorse Lake and there's horse riding in Bryngwyn (01497 851669), while heading out on foot along Offa's Dyke Path or The Wye Valley Walk is also hugely popular. For most, however, it's the 5–10-minute walk to Hay town centre that's the real attraction. Aside from the collection of good pubs and restaurants, the place is awash with quirky, independent shops. It is particularly renowned for its antique and vintage shops and book shops. A breakfast bar onsite is available on busy weekends and for whole group bookings (contact the site to discuss). Local produce is available from the Hayfield Community Garden during summer months or in Hay Town at the Deli and Greengrocer (01497 820708). There's also an excellent local butchers (01497 820636). Racquety Farm has raspberries for sale (end of June–September) with a 'pick-your-own' that is particular popular with families. Homemade apple juice is also for sale while stocks last!